Still very windy and fairly hot but luckily mostly a side wind. Just outside La Rochelle the road turns into a motorway, bikes are not allowed. Perhaps there is another road not shown on my map? At a nearby out of town huge shopping estate (and I mean HUGE) I first asked at a supermarche (the biggest I have ever seen) “non”, then a filling station, “non” then a sports equipment place “peut etre”. Apparently at the coast, about 2 miles away they thought there was a cycle path. There was but it didn’t go very far. Then there was a tiny road at the end of which there was a choice of two. I took what turned out to be a dead end and had to re-trace my steps (cycles?). Eventually I found a disused rail track to a place called Fouras, which I took, yes, another dead end to the coast but Fouras was quite a pleasant little town and very gradually I was getting past the motorway. Finally at Rochefort normal roads appeared and I rode to Royan and caught the ferry across the mouth of the Gironde to Soulac sur Mer. I found the Massai campsite at L’Amelie a further 4 km or so south of Soulac at about seven. It was a warm evening spent mainly drinking wine. The Massai are actually Chris and Chrissy Massie my neighbours from Cornwall who holiday here most years to escape the stress of Goongumpas city life. I awoke with a slight hangover and was dragged by the Massai into the local supermarket to buy more wine as I was accused of cleaning them out last night. (Well cycling makes one thirsty). The wine was cheap but good enough. We went down to the bar near the beach at l’Amelie and had a beer. It was a nice day, sunny and 17ºC. However the Massai informed me it had been 27ºC the day before yesterday. Oh well perhaps it was not such a nice day after all. In the afternoon I walked down the coast to the local beach. It was a nudist beach, lots of wildlife - beavers mainly. It was a huge beach, each nudist having an area the size of Fistral to him/herself. That evening I cleaned the Massai out of wine again but at least some of it was mine this time. Heavy rain all night left my sleeping bag wet and it was still raining a bit in the morning. My tent is a three man affair that Kath had bought in Australia, it is very good at keeping insects out but as for keeping rain out it is as much use as a chocolate teapot although it did have one major advantage in that it was big enough to accommodate my bike with panniers attached which must save about half an hour a day and more than compensate for the time lost cycling uphill with the extra weight of a larger than normal tent. I decided to stay on at Soulac for another day rather than ride in the rain. We went into town to look around as the nudist beach lacked appeal in this weather. It was a Sunday so most of the town was shut but we did visit a "model house and train" exhibition, the houses were models of real ones in Soulac and the train had sound effects “chuff, chuff, wheeee” if a model steam train was going round and “plop, plop, plop, eeeee aawww” if it was a diesel. Both had “rat a ta tat, rat a ta tat” rail noises in the background. The speed of the rail sound effects could be altered to match the speed of the trains but it was disappointing that the note did not change when the train went through a tunnel nor did the sound effects add coughing noises when the steam train went through the tunnell. In the evening we went with the neighbours from the campsite Ulrich and Sabina and their exceedingly beautiful daughter Agnes to a local, well about 10 miles away near La Verdun, restaurant that they recommended. 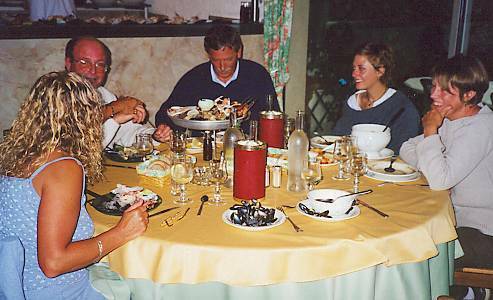 It was a fantastic meal, the best I have ever had in France without doubt. I think I love Agnes. I had the set 120 franc menu, moules, followed by mini fruit de mer, followed by steak, followed by a posh pudding all beautifully done. The whole meal including wine, coffee and tip came to £18 for me and was well worth it. Later at the camp site we drank a bottle of Margaux that I had bought earlier. It was rather disappointing after the meal, and Agnes, she was a saint. (Cornish joke). That night it tipped down, everything was wet again, but at least by the morning the rain had cleared up. Instead of following the coast south I decided to ride inland along the south coast of the Gironde through the Medoc wine area towards Bordeaux. My map did not show any small roads along the coast but a larger scale map I had seen at the campsite office showed that there was one so I rode to Verdon sur Mer hoping to find it. Verdon turned out to be a dead end with a container port nearby but no small road, so I had to ride 10 miles back to the main N215 road to Bordeaux. I called at a garage and was given a map and brochure of the area. 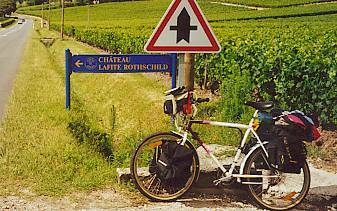 Now knowing where to go I joined the coast road at Saint Vivien de Medoc and cycled to Pauillac along a very pleasant small road through lots of famous wine villages. There was hardly any traffic, the sun was out, there was a following wind, things were looking up. It is amazing how well kept the hundreds of vineyards are, hardly a weed to be seen among the neat rows of vines. 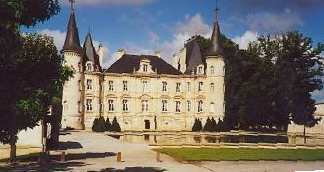 As I approached Pauillac the chateaux became more impressive with famous names such as Chateau Lafite Rothschild. At Pauillac there was a camp site so I decided to stop as the weather was looking dodgy again. It was lucky I did as it later appeared there are no other sites in this area. I put up the tent and as the sun came out again hung my wet sleeping bag and clothes out to dry on the fence then rode into town for a meal. I continued up the Gironde to Margaux just to see what the town where some the best wine in the world comes from looks like. It looks just like any other town (more village actually) but more chateaux than ever and one small shop that was open. I managed to buy some bread and tomatoes and had that for lunch in a convenient bus shelter as it was not very warm with a cold wind blowing in from the coast. After Margaux I cycled back to the coast, which from Castelnau de Medoc to Ares was almost entirely a cycle path, part of the Bordeaux to Ares cycle path 1985. (so the signs said). These are like small roads about six feet wide and tarmac surfaced with a white line in some places. They are good from the point of view that there is no traffic (very few other bikes for that matter) but rather boring as the country is completely flat. They are mostly dead straight and pass through an endless pine forest. There are no cafes or shops for miles on end. 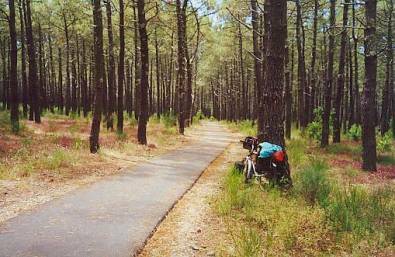 I intended to ride to Arcachon or at least Biganos but while on the cycle path just outside Ares I had a puncture. This coincided with the exact moment it started to rain heavily. I repaired the puncture in the rain by leaning over the tyre as there was no shelter. When I came to pump it up it did not seem to pump up to much pressure, my repair obviously had not worked. I carried the bike into Ares and found a bus shelter to have another attempt to repair it out of the rain but exactly the same thing happened. It was the pump that was at fault (new before I left, thank you Halfords), not the repair. Luckily there was a camp site nearby and I borrowed their pump but it was to late to continue so I put up the wet tent there and went into town for a meal of moules followed by steak again (well they don’t seem to have much else). That night it poured down continuously and also the next morning till about 12 o’clock so I sat in the wet tent till then. I wanted to buy a new pump at the first town that had a bike shop which I had been told was Andernos just a few miles from Ares. Initially I couldn’t find the shop so I had lunch of moules and chips at one of the seafront cafes that specialise in them, by that I mean that’s all they seem to sell. After lunch I eventually found the bike shop and bought a new pump, this one worked. The pump cost 60 francs, as I was short of cash I called at a nearby ATM to get some more money. It ate my card and I had to wait an hour and a half for the bank to open (they have very long lunch hours in France). When they opened they wouldn’t give the card back as it was in Kath’s name not mine. Following a long and noisy argument they finally gave it back after I contacted Kath on the mobile, her sending a fax etc, etc etc and me accusing them of stealing it and threatening going to the police. It was after 4 o’clock before I set off and almost dark by the time I got to Arcachon which is a big touristy type of town along the lines of Newquay. The camp site was OK but rather expensive and too far outside for me to bother cycling into town for a meal. It had stopped raining and the campsite shop sold wine and things so I went back to the tent for a feast. This turned into a drinking session with the French fellow in the nearby tent. He was from Paris and had a stall on the fish market there. His English was as good as my French, that is basically not very good. After a couple of bottles of wine each we seemed to be able to slur a sort of Franglais we could both sort of understand (I think). Never write in your diary that things cannot get much worse, they can. There was rain and wind all night and some Spanish party to about 4 am in the next door (flap?) tent meant not much sleep. It was still tipping down in the morning. Once again as everything was already wet I thought I might as well set off. I stopped for lunch at Hossegor. It was raining quite hard and only 13 degrees according to one of the streetside giant digital thermometers. There were lots of surf shops but most of the trade seemed to be in umbrellas. After lunch the weather got even worse as I rode through Cap Breton and Anglet. I could see Bayonne as I crossed the river but gave it a miss as it looked dismal in the rain. 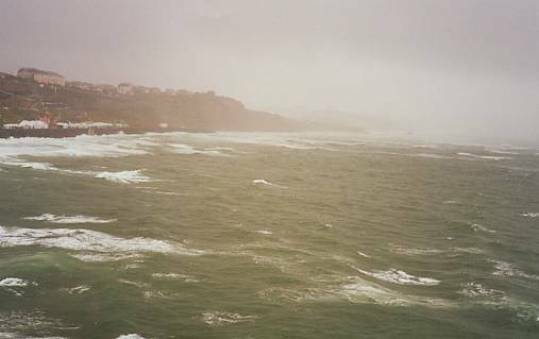 By the time I got to Biarritz the weather had become horrendous, a howling gale shredding all the summer flags and utterly torrential rain. On the headland I had to push the bike into the wind as it was too strong to ride into it. I also had to push the bike through town due to the traffic being at a standstill. The buildings did give a bit of shelter though. Having got through Biarritz I thought to myself that everything is so bad it is almost funny and again things can only get better now when “bang” a puncture in the rear tyre forced me to reconsider the funny aspect. Good news - there is a bus shelter the other side of the road perhaps I can repair the puncture out of the still torrential rain. Bad news - the bus shelter is full of broken glass and doubles as a toilet. I will have to repair the tyre in the rain. Good news - I bought a spare inner tube after my last puncture in Ares so I won’t have to fumble with patches and I effect the repair in a few minutes and start to pump up the tyre with my new pump. Bad news - (no the new pump works OK) – but a balloon sticks out of the tyre, there is a 3 inch split in it that can’t be repaired (new tyre before I left, thanks again Halfords). I have to carry the bike around the corner towards Bidart in the hope that I can get a new tyre somewhere. Good news - around the corner is a car tyre garage surely they will have a bike tyre if I can only get across this very busy main road carrying the bike in the pouring rain. Bad news - they don’t do bike tyres but the supermarket down the road does. I will have to carry the bike to the supermarket back across the busy main road. Good news - the supermarket had a 26 x 1.75 bike tyre and a covered area outside where I can change it. Bad news - although the tyre has printed on it 26 x 1.75 mountain bike tyre but it is far too big for my standard 26 mountain bike rim. Good and bad news - the supermarket refunded my money and I booked into the nearest campsite, rather expensive at 135 francs but beggars can’t be choosers and at least it was within a mile. It was then nearly 7 o’clock on a Saturday evening so it was looking as though I would have to stay until Monday before I could buy a tyre but the camp site owner said a bike shop back at Anglet (about 25 miles) might be open until 9 so I caught a taxi. The taxi misted up when I got in it and because of the still heavy traffic in Biarritz we got stuck in a jam. Good news - Luckily the driver tried the local Biarritz bike shop and just before they shut I bought a tyre hooray. I thought at the time it was unusual for a taxi driver to turn down a 50 mile trip but in hindsight maybe it was because I was not the ideal passenger, not speaking much French, soaking wet and then again there were my feet which for some reason had acquired an odour all of their own in the damp conditions! Back at the expensive camp site I had a meal in their restaurant, put the tent up in the rain again and crashed for a peaceful night’s well earned sleep. 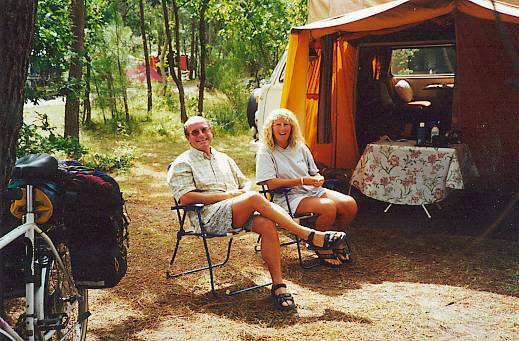 ‘Fraid not', the part of the camp site I was in was next to the busy road and a disco which thumped away until 4am when the rowdies left with screeching car tyres (Did I ever do anything like that in my youth? Surely not). It turned out to be the most expensive camp site of the whole trip and perhaps the worst.